Titan Enterprises has recently launched the CUB5, a versatile multi-function instrument that can display flow rate, total flow or automatically toggle between the two. The CUB5 is the ideal device for continuous monitoring, test rig, consumption metering and flow switching applications. The selection of the correct instrumentation to accompany a flowmeter is critical. Many flow metering applications are compromised by the incorrect specification of the control or process indication. The CUB5 is a digital instrument that includes an 8-digit LCD display panel enabling users to immediately see current flow data. Each unit is constructed from durable polymeric materials which provide IP65 (NEMA4x) protection. 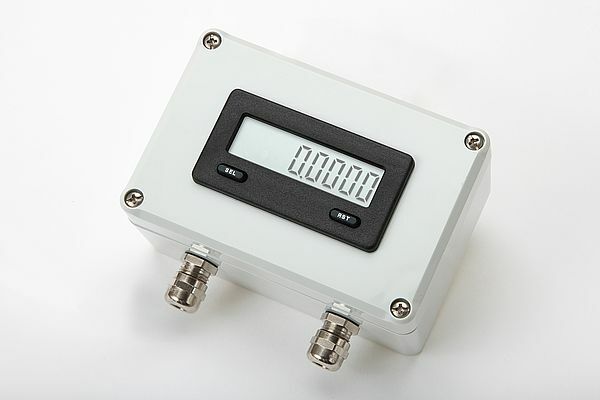 Connection of the CUB5 to your flowmeter can be configured through the use of screwed terminals on the rear of the instrument. In addition the CUB5 has selectable pulse damping which prevents erroneous pulses during operation. Used as a totalizer the CUB5 can be programmed for one of eight different count modes and/or rate indication with an optional relay card for a total or rate set point. There are two separate count inputs that can be programmed with differing scale factors and the display being the sum, difference or bi-directional total of these counts. The rate function on the CUB5 can be viewed at a touch of the front panel, via a remote command or automatically periodically displayed as the instrument cycles through all of its programmed functions. The CUB5 also has an optional relay card which may be configured as either a rate or count function and be set to latch, automatically reset or reset itself after a pre-set time. The user input can be set to accept an external input to control some of these functions. Beneficially the colour of the backlight LCD display on the CUB5 can be made to change when a set point is reached to offer you an immediate visual warning.